Patra's Other Place: Coles finally doing the right thing! Last week I signed an online petition regarding the lack of support given to Aussie farmers and producers by the government and big retailers. This is either an incredible co-incidence, or somebody out there has seen the petition and made a hasty decision to get Coles back into favour! It's about bloody time. 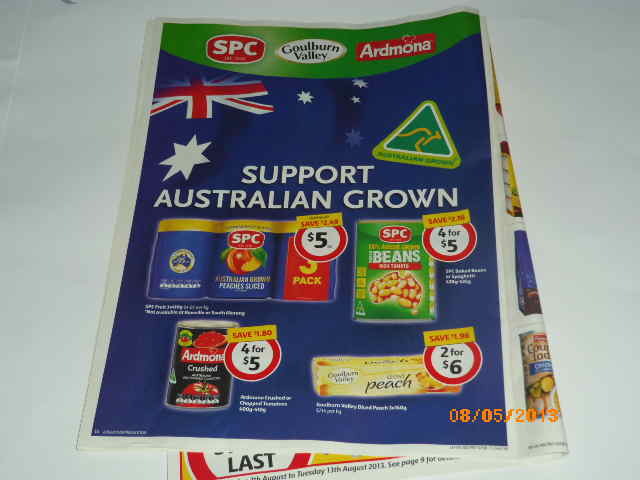 SPC Ardmona and their suppliers have been having one helluva time in recent years, with the drought, followed by floods, and to top that off, the big shops bringing in so much 'fresh' food from overseas.